He’d traded upscale microbrews for the comfort of Bud, a step down on the beer drinker’s food chain. To open up Food in Fiction, I’m sharing a few food moments from the book. Then I hope you’ll join me throughout the month as other authors share their work and the food featured in their fiction. From chicken gumbo to chocolate cake, from literary fiction to thrillers, I hope there’s something on the menu to suit every taste! Usually, exhausted after a long day on the job, he ordered room service or ate in the bar at his hotel. Occasionally, he’d take in a movie. He’d finished early today and hadn’t felt like hanging out in his room, so he’d asked the concierge at the Marriott for a recommendation. The food at Marcus was decent, the concierge had told him, and they served some interesting microbrews, which had caught Will’s attention. The ambiance played to a professional crowd in their thirties and forties: dark paneled walls, Tiffany chandeliers, and a brass-accented marble bar. From Thursday to Sunday, they brought in jazz bands. Too bad it was Tuesday. He’d have enjoyed hearing a band. Will downed the dregs of his beer and peered down the bar, attempting to catch the eye of one of the bartenders. The two guys on duty were setting up for the evening crowd, one checking inventory, the other replenishing the wine rack under the counter. Frustrated by the slow service, Will fished for his wallet. He’d no sooner laid his credit card on the bar when a third bartender, a perky redhead, strolled out of the kitchen. All three wore the same uniform: tuxedo trousers, black satin vest, starched white shirt, and a red, white, and blue tie. One of the guys said something and she shook her head, laughing, and pulled a menu from a pile by the cash register. In her late-twenties, Will figured. Her biceps suggested membership at a gym. She had an upturned nose, nice chin, warm green eyes. She reminded him of Nicole Kidman’s sexier, less regal little sister. “Will.” Why did women insist on shaking? It always felt forced. ideas for a proposal he could sell Cushing, trying to work his way home. As usual, her father had left for work early. Her mom and Leah were still in bed. Justine enjoyed the quiet, her mind wandering freely. In the kitchen, she prepared apples for crisp. 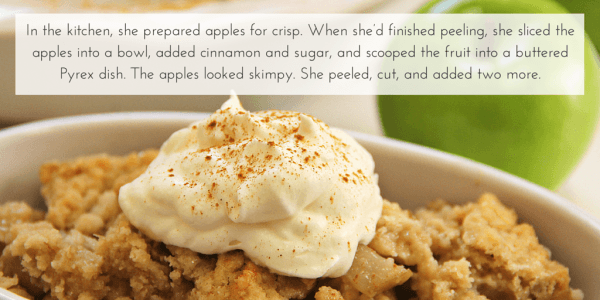 When she’d finished peeling, she sliced the apples into a bowl, added cinnamon and sugar, and scooped the fruit into a buttered Pyrex dish. The apples looked skimpy. She peeled, cut, and added two more. Maybe she and Leah could go to the nursery when Leah woke up. Leah didn’t have her license yet. If they paid for the gas, maybe Hope could borrow her mother’s car and give them a ride. They’d select the fullest, prettiest tree on the lot, a tree so magnificently tall, it would stretch, like the tree in the Nutcracker, to the family room ceiling. Justine had saved her birthday money and most of her allowance; she had three hundred dollars stashed in her bureau. If she had money left over, she would buy a wreath for the front door. Zoe studied the menu behind the counter: regular coffee, house blend, coffee of the day—Guatemalan Antigua today. They also served decaf, espresso, cappuccino, mochaccino, latte, plain, pumpkin, or vanilla. All the discomfort Zoe had felt when Jerry arrived had disappeared. In the car, they’d talked briefly about her accident. She’d surprised herself, telling him the accident had changed her life. How melodramatic, she thought, though in some ways it had. She felt like a different person, someone she was not sure she liked. She’d admitted her ambivalence about returning to work. “Thinking can be paralyzing,” Zoe replied. It felt strange talking philosophically with Jerry, the words stilted like a new suit or a hairdo she was trying on to see if it fit. As the conversation evolved, the words began to feel urgent and real, and she’d realized for the first time in a long time, she was talking about feelings, thoughts. Not about her family. Not about Leah. About herself. She’d lit the stove too soon and the griddle overheated. She fed the first batch of pancakes, the tops raw, the undersides charred, to the garbage disposal. Zoe ladled six more onto the griddle, frying them to a deep golden brown. She flipped the pancakes onto a plate, folded one on top in half and stuffed it in her mouth, and ladled six more. She’d used all but a cup of blueberries. She couldn’t refreeze them, and since she hated to waste perfectly good berries, she decided to make muffins, to freeze for later in the week. As she slid the pan into the oven, she noticed the over-ripe bananas on the wooden tree by the sink, mixed batter for bread. While the banana bread baked, she whipped up a batch of chocolate chip cookies. As a special treat, she made a pecan pie, Leah’s favorite. By late afternoon, the house looked and smelled like a bakery, the counters lined with banana bread, fudge, chocolate chip cookies, lemon poppy seed cake, pecan pie. 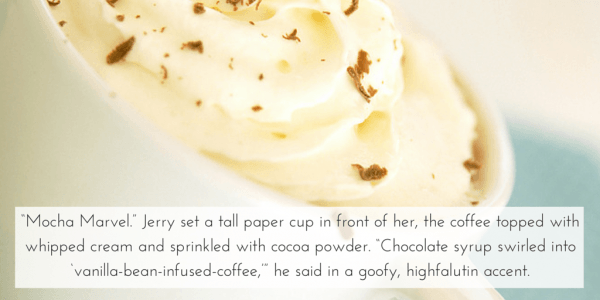 What are your favorite ‘food in fiction’ moments? When has food enhanced a story for you? 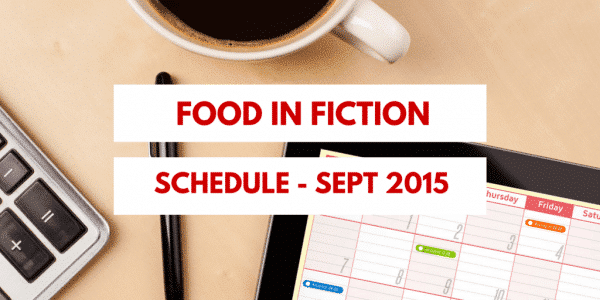 Follow Terri Giuliano Long’s board Food in Fiction (September 2015) on Pinterest. 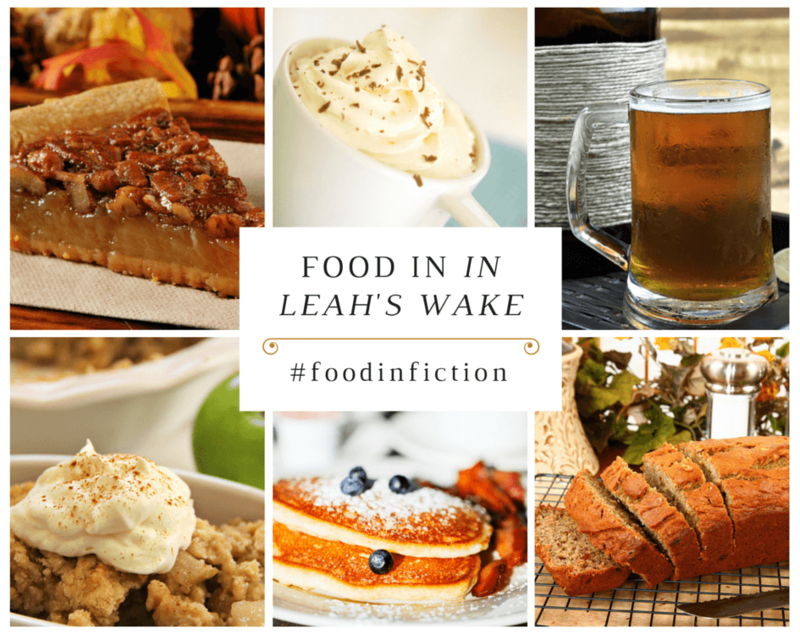 Pin, follow, visit or share and keep stopping by each day to Tweet about Food in Fiction – each of these will give you a chance to win. Great post! I grew up in family’s restaurant, so food has always been an important part of my life. I enjoyed reading the Trixie Belden series of books as a young adult. 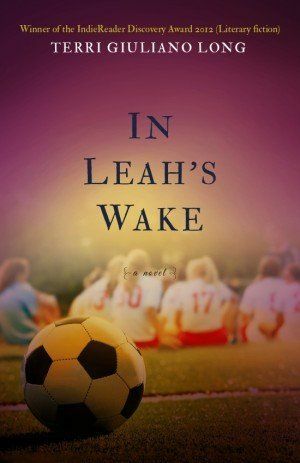 Lots of great food moments, when their club would ‘raid the icebox.’ As an adult, I’ve enjoyed reading lots of Nora Roberts books; in particular, the Chesapeake Bay series featuring the Quinn brothers. Good food memories: Anna Spinnelli’s red sauce, and the big summer picnics complete with fried chicken, pie and cold beer. Looking forward to the month of September and more posts :) Best to you! These are fun posts! Yum! Thank you, Crystal! I’m enjoying them too!